This is the fruit or goal of the Torah. In English, we call it LOVE. Chesed - as a noun: lovingkindness, love, mercy, devotion, favor, gracious. Chesed - as an adjective: devout, pious. 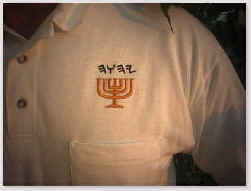 Spelled with 3 Hebrew letters: HETH-SAMEK-DALET HETH="FENCE, WALL", SAMEK="PROP", DALET="DOOR"
way to understand the meaning of the phrase at 1Yahuchanon 4:8, and 1 Cor. 13:13. The word CHASID is used often at Psalm 136. It seems that Paul intended that we understand the true meaning of "love" at 1 Cor. 13:13.
friend, caring, or beloved, so it fits the idea of "love your neighbor as yourself" better than CHASID would. Note: Often, "modern" Hebrew will transliterate "AHABA" as "AHAVA". While there's no letter "V"
different Hebrew word than "AHABA" - the letter "beth" is absent, and in its place is the letter "waw". CHASID is a much richer word than AHABA. and the word used here is AGAPE - a higher, richer word than PHILEO (love, kiss). "PHILEO" to more closely relate to "AHABA". used the Hebrew word "AHABA" twice to Kepha, and the third time used the word "CHASID". WOULD THE CREATOR'S RELIGION HAVE A GREEK NAME?